Kurtz-7pm Joelle, Trent, and Trudi, an indie-rock trio, sing a mix of originals and covers with piano, guitar, pump organ, percussion, and three part harmonies. Andolino-8pm This five member alternative rock band, which has played at both Newport and The Basement, adds the accordion, viola, xylophone, and melodica to the standard three piece, carving out its own sound. 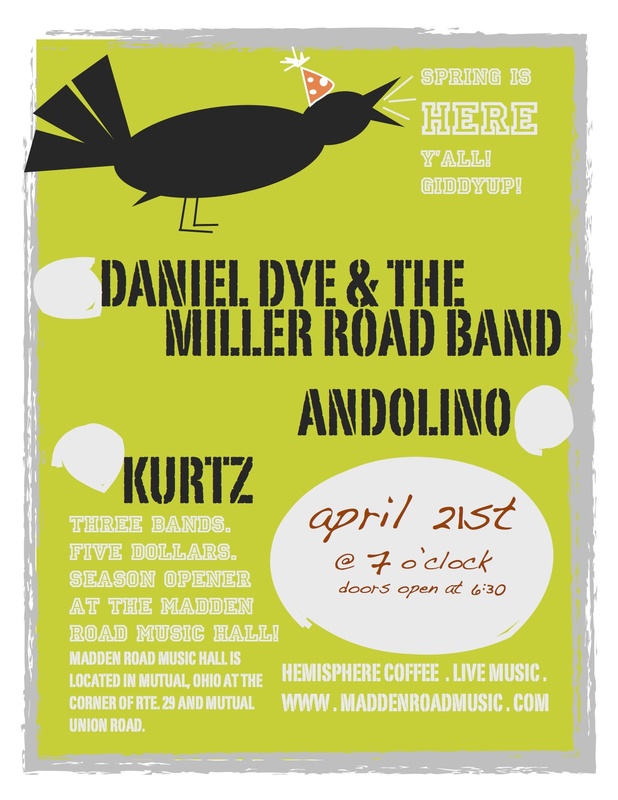 Daniel Dye and the Miller Road Band 9pm– Songwriter Daniel Dye, along with his nephews and niece will try a mess of new/newish songs that may or may not make it on the next album, partially due to your response. And as always, there’ll be a mix of guitar, harmonica, banjo, violin/fiddle, cello, and mandolin. Location- Go to venues/maps tab on this website. Email maddenroadmusic@gmail or call 937-328-0432 if you have any questions.